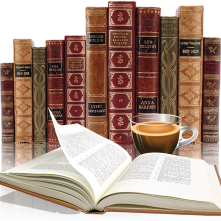 I was first introduced to Aime K. Runyan with her Daughters of New France series, Canadian historical fiction set in the early years of Canada’s history. 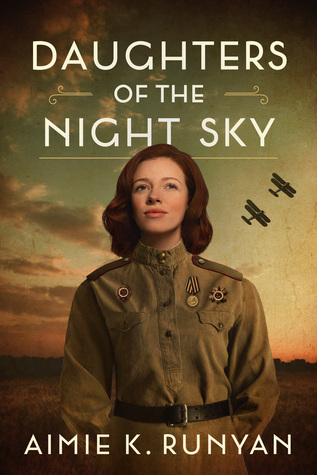 With Daughters of the Night Sky she has traveled well off the beaten track, venturing into Russia during the Second World War. 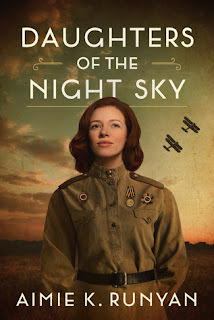 Daughters of the Night Sky is inspired by the female pilots known as the Night Witches and told through the eyes of one brave woman. With so many novels about World War II taking place in various European countries this was a refreshing change to see inside the Soviet Union, under the command of Stalin. This was a learning experience for me as I did not know about these brave women who wanted to serve country while overcoming so many obstacles. The amount of research in this book is evident as the author portrayed a very vivid picture here, from the struggles these women endured to the desolate landscape and so much more. Daughters of the Night Sky is a story of strength and bravery, how these women had a desire to do their part in the war effort and the determination to reach their goals. They sacrificed so much knowing each flight could be their last. This book was a pleasure to read and one I recommend to those that love not just Russian, WW 2 history but those that crave something different. My sincere thanks to the author (via netgalley) for an advanced copy in exchange for an honest review.